Willa Cather once famously wrote, "A soup like this is not the work of one man. It is the result of a constantly refined tradition. There are nearly a thousand years of history in this soup." The American author was waxing poetic on the nature of a finely crafted French Onion, but she might as well have been describing the scene at Youth Villages' annual Soup Sunday fund-raiser, where Memphis' favorite restaurants assemble to serve up sample-sized portions of comfort, tradition, innovation, and steaming hot love. The Flyer has almost always sent emissaries to this event to sample and respond, and over the years, we've identified and described countless styles. We've tasted cheddar cheese soups, shrimp bisques, tomato dills, hot & sours, chicken noodles, and more gumbos than you can shake a stick at. There have been she-crab soups, potato soups, tortilla soups, cups of hearty beef stew, and that's just getting started. Soup isn't the only thing up for grabs when one of the year's tastiest events returns to the FedExForum Sunday, February 17th. There will also be fresh-baked breads, desserts, and specialty items. More than 50 restaurants will be serving, and participating food service providers range from Huey's, Mosa, and Blues City Cafe to Vanelli's Deli, Amerigo, and bakers like Cupcake Cutie, etc. 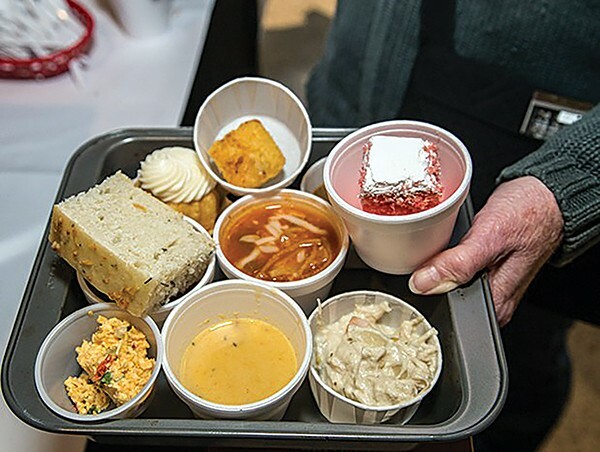 Over the years, the Soup Sunday event has raised more than a million dollars to support the Youth Villages mission of helping children facing mental, emotional, and behavioral problems.